Here we go with the one and only Electro Hippies, one of UK's top 80's punk grinders and home of Jeff Walker prior to Carcass, and the band with the best moniker in the universe, well ok Bomb Disneyland or Dr. And The Crippens were fine ones too. 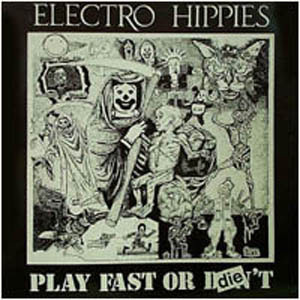 Yet Electro Hippies are very very fast and faster and very very punk and louder through the rampant metal riffage within the permanent campaign for musical destruction, grinding ZER!!! Focus on 'am i punk yet', hit song! CHAOOOOSSSS && ZZZEEEERRRRRRR!!! Peel session & play fast or die: vinyl rips. The only good punk: CD rip including the live album and comp tracks. Been looking for the split with Generic. Thanx for your time and energy.